NEWS-TIMES PHOTO MARCUS DAY Making a difference: Living Hope Ranch's Bernadette Dowkes (left), program director, and Kristen Zilkie, director of communications. Two women, two contrasting backgrounds, two perspectives, one dream. 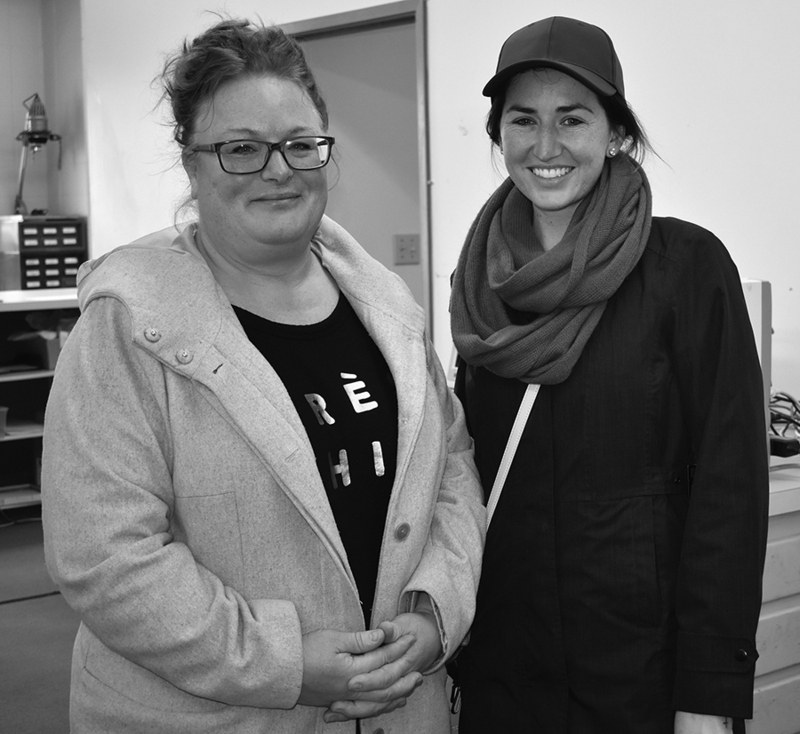 Meet Kristen Zilkie and Bernadette (Berni) Dowkes, whose different experiences are helping to shape a year-long residential program for teenage girls struggling with “life-controlling” issues. While Zilkie’s background speaks of balance and stability, Dowkes was a teenage mom on a self-destructive path. Her work in correction centres brought her face-to-face with the kind of person she could have become. “We help each other grow,” agreed Dowkes. The pair are driving forces behind plans to relaunch a Christian program that will reach out to “children from hard places”, some of whom have been adopted. It will focus on mentoring, life skills, education and faith as it addresses issues like self-harm, substance abuse, eating disorders and mental illness. A key feature will be using horses for building trust-based relationships and enhancing confidence and self-esteem. The program will be run from Living Hope Ranch, a facility just south of Cypress Hills Park at the Diamond Willow Retreat. Midway between Consul and Maple Creek, it will be open to girls aged 13 to 17 across Canada, accommodating a maximum of eight at any one time. The opening date of this non-profit, charitable enterprise depends on funding. So far 10 per cent of the proposed initial financial outlay has been raised. For Zilkie, the Living Hope Ranch is the fulfilment of a dream that started in Los Angeles. Raised on a Consul farm in a loving and supportive household, she went to LA in 2012 to do an internship at The Dream Center, a faith-based charitable organization that offers hope and healing to families and individuals broken by poverty, addiction or abuse. Zilkie helped teenage girls in a recovery home in downtown LA. “It was while talking to a teenage girl that I had an “aha moment” that convinced me I wanted to do this work. She was yelling at me, saying that I didn’t understand what she was going through because I had never experienced her issues. For a moment I believed her, then reality struck and I realized it wasn’t true. I said ‘ I don’t know what you’ve experienced, but I know it doesn’t have to be drugs and pain’. That “aha moment” told me I could bring another perspective, to show that life doesn’t have to be full of crises, that there is something else to aim for. The building blocks for Living Hope Ranch (LHR) were put in place: a board was formed, made up of people from Consul, Maple Creek, Moose Jaw and Swift Current, with Pastor Manley as chairman; LHR was registered as a non-profit organization in 2015; charitable status was obtained in 2017. The program opened in January, 2016, and ran for five months. In that time it had three clients. But it proved a false dawn. As director of communications, Zilkie’s role is to bring public awareness and support the development and progress of LHR. She will handle questions about the program, whether from the media or the public, and is available for public speaking engagements, corporate meetings or interviews upon request. The job involves a lot of travelling. Dowkes hails from Jasper, Alberta, but spent of her adult life in B.C.’s Lower Mainland. She had worked with volunteer social agencies and served with B.C. Justice as a correctional officer. Dowkes said penally systems did not work, no matter how much money was spent on them. Dowkes said she felt blessed to be approached about working at Living Hope Ranch. “I am absolutely thrilled. To find the job where I know I belong is a small miracle in my life,” she said. She believes her life and employment experiences, combined with her years of volunteering with teens and adults at risk, have built a vast resource of knowledge that can be applied to her job as program director. After resigning her position in B.C. Dowkes relocated to Saskatchewan. She now lives in Piapot with her husband Joe. Living Hope Ranch will operate from a building on a quarter section of land. Co-owned by a number of families – including Paul and Betty Swihart – it was used as a retreat cent. Now LHR has agreed an affordable rent. The facility offers four bedrooms (two girls per room), an office, counselling room, large kitchen and a common area. There will be at least two staff on site day and night. The program is founded on trust-based relational intervention methods. Such a trauma could have been caused by staying too long in the birth canal; it can lead to oppositional behaviour. Other issues could include attention deficit hyperactivity disorder (ADHD), mental illness, schizophrenia or depression. *Life skills: these could include cooking, gardening, cleaning, laundry, farm duties, musical training, sewing and exercise. Residents will also be involved in community service projects. *Education: LHR will offer distance learning education correlating with the Saskatchewan curriculum. *Faith: although the program is faith-based, it is open to everyone. Each student will be assigned a staff mentor and they will meet regularly to discuss needs, goals and personal growth. *Equine program: horses are used to aid personal growth. Bringing residents together with horses can help with identifying emotional needs. The benefits include developing healthy relationships based on mutual trust, building confidence and learning problem solving skills. Zilkie and Dowkes agree that today’s teenagers face immense challenges, particularly with technology impeding one-on-one relationships. Zilkie said Living Hope Ranch’s longterm goal was to set up other facilities in Canada.